Mintage just 5966!!!! 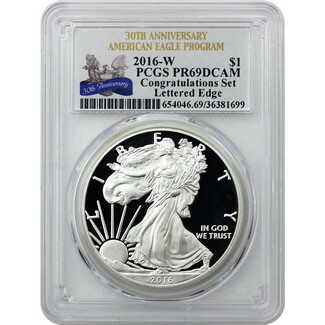 Struck at the West Point Mint, this is the 2016 Proof Silver Eagle from the Congratulations Set. This special 30th anniversary issue has edge lettering and is certified in near perfect PR69 DCAM condition by PCGS, with the all-important "2016 Congratulations Set" notation with their 30th Anniversary Label. This is the lowest mintage Congratulations Set ever and compare with 75,000 in 2017 and next lowest of 7529 in 2014! Population from PCGS on this coin is a just 140 coins! Arrives in The Coin Vault's custom certified presentation box.